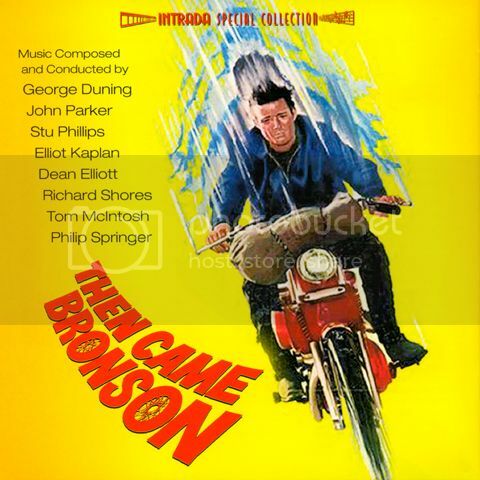 Film Score Daily: My Vintage Selection for 2013, Part 2! My Vintage Selection for 2013, Part 2! In this final part, we will thoroughly analyze the television music of one single decade: the Swinging Sixties. Let's ride along with wayfarer George Duning and his gang of composers! SPECIFICATIONS: APART FROM ECONOMICAL FACTORS, THE CRITERIA ARE BASED ON THE FOLLOWING AXIOMS: THE RICHNESS OF THE ORIGINAL RECORDING, THE INTEGRITY OF THE INSTRUMENTAL MUSIC, THE LEVEL OF INNOVATION, THE PACE OF THE CORPUS, THE ELEMENT OF SURPRISE, THE COLOR OF THE INSTRUMENTS USE, THE CROSS-REFERENCES. All soundtracks are classified in the alphabetical order of the composers. LN means “Liner Notes” and they include authors dealing with cinema/tv and music analysis, track-by-track commentary, vintage LP notes, technical talk. 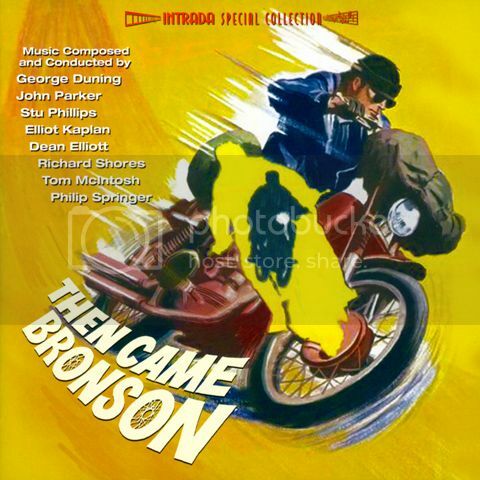 This Then Came Bronson 2-CD set is the conclusion of a former FSM multi sets entitled TV Omnibus, vol. 1 that has already contained scores by George Duning (the pilot score) and Gil Mellé (“The Circle of Life” and “The Forest Primeval”) from that series—I listened again to these three scores for the sake of the corpus. → CD 1 is a full Duning disc with 6 scores—the composer exploits the same Yamaha E-3 organ as in Star Trek but in “Lambert” from “All the World and God” and in “To The Derby” [00:11 to 00:15] from “Your Love is Like a Demolition Derby in my Heart”. Duning has the knack to fashion beautiful or melancolic melodies. Two scores go beyond the markers and anticipate the second CD: “The Old Motorcycle Fiasco” and the pseudo youth-oriented “Your Love is Like a Demolition Derby in my Heart”. → CD 2 is a collection of composers dominated by John Parker with 5 scores (“A Famine Where Abundance Lies”—featuring a harpsichord use a la Man from U.N.C.L.E. season 2—, “Old Tigers Never Die—They Just Run Away”, “A Long Trip to Yesterday”, “Mating Dance for Tender Grass”, “Where Will the Trumpets Be?”) and Richard Shores with 3 scores (“Sibyl”—it refers to a torn-inside Hawaii Five-O score—, “Lucky Day”, “The Ninety-Nine Mile Circle”—it refers to the fourth season of The Wild Wild West). This particular CD deploys a wealth of eclectic music. My favorite score (“Against a Blank Cold Wall”) is by Dean Elliott because it reminds the odd experimental jazz side of Gil Mellé from Death Lends a Hand combined with Ron Grainer’s The Omega Man. Philip Springer delivers a fancy hip Eastern Indian score entitled “What’s an Ark without Centaurs?” that starts with sitars and later turns into love music straight from Burt Bucharach. On the whole, these scores leave you with the idea that they were conceived as Americana music. The best way to appreciate this music is to drive on a long and deep mountain road and that’s what I used to do. The Man from FSM Lukas Kendall is credited as a producer. The Krotons is first a serial from the late 1960’s era of Doctor Who and pure “musique concrète” in the line of Varèse and Stockhausen: tape work and sound design. As a soundtrack, it is a collection of atmospheric sounds and rather austere, gloomy, mechanical and utilitarian ones. On the whole, it is an interesting piece of bare archeo technology which relies on a machine called “Crystal Palace”. For scholars and sound engineers of vintage soundtracks like Gil Mellé’s The Andromeda Strain only. Best tracks are: “Kroton Theme”, “The Learning Hall”, “Panels Open”. It took me a while to get into the Bronson scores (I'd never heard of the show until I got the TV Omnibus set) but there is some nice variety there. And it's always nice to hear a bit more Richard Shores music.